Outliner software and document organizer for MS Word » The rebirth of Writing Outliner: Rewritten software and new website! I am using Writing Outliner editor with great pleasure, and I want to upgrade. Having all sorts of problems, a series of error messages, can’t even uninstall because of a error message. Really like the program but the 64 bit update is not working for me. Great news! Have been eagerly waiting for 64bit Word support. Hi Hollis, sorry for the inconveniences, after all, it’s the first beta test release 😛 I’d appreciate and it’d help me a lot if you can send me the error messages. Will there be an upgrade cost when this comes out of beta if I already own a license of Writing Outliner? @leea, as I stated in the post, there will be no cost upgrading to the first release of WordOutliner from Writing Outliner. I hope you implemented or are planning to implement split and join feature. Where you can split a note into different notes reaarange the notes and then join them together. It is really one feature that I really need and i believe some people need and no one, that I know of, has this feature except InfoSelect. @Peter Martin, it’s already planed. With the new architecture of WordOutliner it’s easier to add new functions, compared to the old Writing Outliner. @peter, you can already rearrange the files in the outline view using drag-and-drop, you are the second people asking for this, looks like that’s not obvious enough? About viewing by file titles, well, it’s been planed. Sorry too many questions. As you may have known I am one of Writing Outliner’s greatest fans…I mean FANATIC. I actually bought Word in order to run your program…Without WritingOutliner I would have settled for that free (Libre) substitute. @Peter, thank you! Your questions will help to improve WordOutliner. If you click the add button at the Project List pane, you’ll find a menu item titled ‘import a Writing Outliner project file’. @Hollis, I’ve just updated the program and the uninstallation is working now, you can download the new version, install it over the old version, then do the uninstall. I actually do not see this version as an improvement. In the older version I could load a document, break into sections by cut and paste into child documents. I am having trouble just creating child documents in this version. So top level now is a folder and child documents are separate documents in that folder? What happened to the ease of outlining capability? It seems you have moved from being focused on a document and being able to subdivide/section it to a file manager within Word that opens documents and creates subdirectories. Am I missing something here? Also what happen to compile? One of the great aspects of WO was working on different sections as in a structured document. Compile would then pull together the documents I wanted to use and produce a single word document. I have not been able to find the capability in this version. Again, have I missed something? Also the MENU item which facilitated all the options also has disappeared. I find controlling the final (complied version) style is a challenge with the current Writing Outliner … I end up doing post-complie document formatting. Will you be able to have a master format template that “manages” the final compiled output (like a CSS style sheet)? @Peter, actually I had a similar idea for ‘global styles’ long time ago, and I think I’ll be able to do that with the new WordOutliner. So Edwin, has Compile been removed from this version? I cannot seem to find it. @RJ, if you happened to read the release notes, compiling is the next thing to come. I’ll answer your other questions here after a similar discussion with someone else. 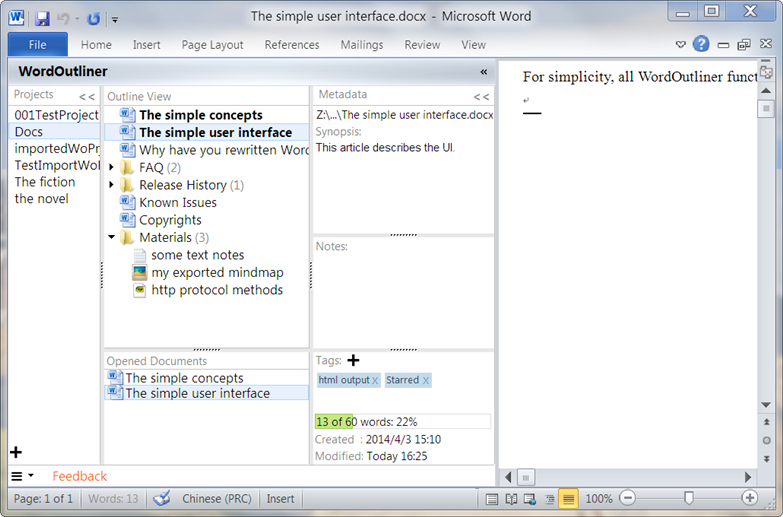 @RJ, this ‘sub-document under document’ feature will be there in a later release of WordOutliner. @RJ, although it has its own advantages, the first beta of WordOutliner doesn’t provide the full feature set of the old writing outliner yet. @RJ, as the release notes says, the compilation is not there yet.